Home » blog » Legoland Malaysia » Maybank » slogan » Maybank - Legoland Malaysia Bloggers Contest - "Why Maybank should give me tickets to Legoland"
Maybank - Legoland Malaysia Bloggers Contest - "Why Maybank should give me tickets to Legoland"
You are required to write a short blog post in your own blog about "Why Maybank should give me tickets to Legoland" (in less than 500 words). Judging criteria will include creativity, originality, and elements of humour. You are allowed to use images or videos to make your post more interesting. 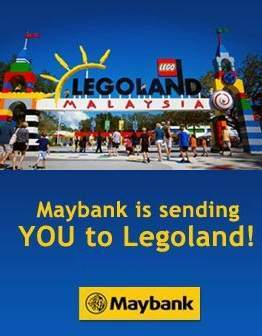 Visit Maybank - Legoland Bloggers Contest for more details. Check out the result here! Awal, Scha, Hanis Zalikha and Faizal Ismail... Who will win the race?